First up , we have the lovely Shailene, which I had to edit due to my camera being incapable of distinguishing it from black. To be fair, it is an extremely dark purple, but even holding a black bottle against a black background, my camera was not up to the task. Shailene is a deep purple packed with gold shimmer, to the point that it was almost paste-like coming out of the bottle. 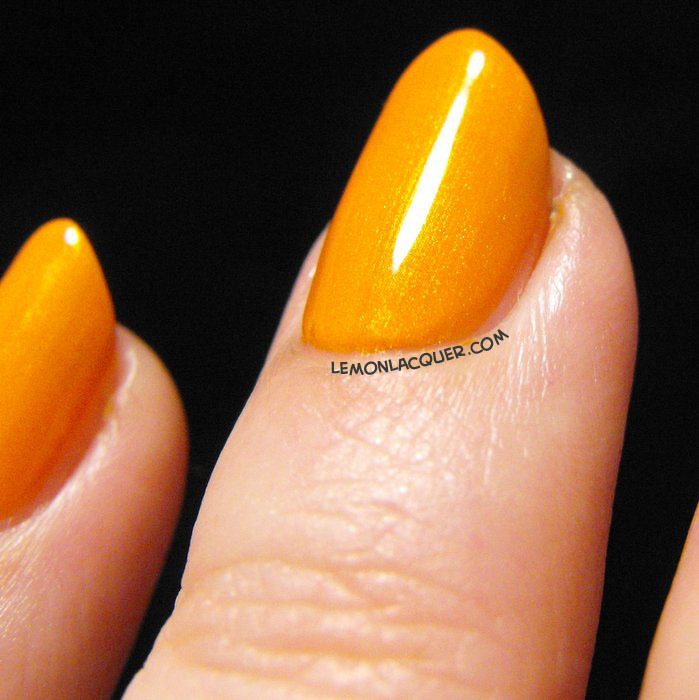 You are seeing 2 coats, and the results of at least thirty drops of polish thinner to get it to the status of “very thick” rather than being able to look into the bottle and see the hole where the brush was sitting. On a more satisfying note is Marjorie, a lovely citrus orange frost. I love the shimmer in this one. This is three easy medium coats to cover 95% of the VNL, and my hard to cover little finger is showing off again if you look closely. Check out that shimmer. I love it. This polish was pretty easy compared to Shailene so I don’t have a lot to say about it, other than loving the shimmer. Shimmer shimmer shimmer. My only gripe is the slight sheerness. I’d much prefer a simple two coater. 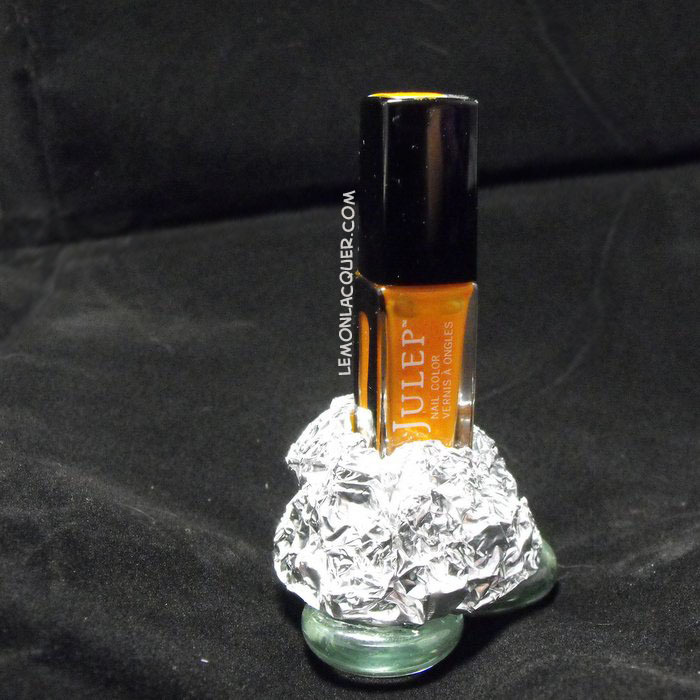 And here is my sneaky trick for using Julep polishes and not just throwing the contents all over the table, the floor, and the cat. I’ve taken a sheet of aluminum foil, wrapped it around the bottom half of the bottle into a ball, and kept the bottom flat. I glued flat glass marbles from the dollar store to the bottom to give it some weight, and stuck a tiny bit of cotton ball in the bottom of the hole so that the nail polish bottle won’t hit the marbles and break. This thing makes my life so much easier, and it cost me something like 3 cents. Have you ever made your own bottle holder? How much tolerance do you have for staining polishes? Let me know in the comments, and come back Monday to see my first attempt at peel off nail stickers!